Atlas Copco has recently extended its GHS VSD+ range of variable speed driven oil-sealed rotary screw pumps. 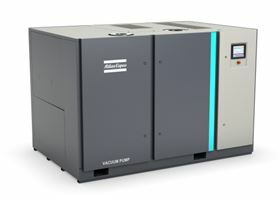 Atlas Copco will exhbit its recently introduced GHS VSD+ rotary screw and DZM multiple dry claw vacuum pump systems, as well as the GA VSD+ oil-injected compressor range, which are designed to deliver energy savings and are suitable for use in a variety of packaging and processing applications. The company will also be exhibiting nitrogen and oxygen generators and high-pressure oil-free compressors for PET blow moulding operations. Atlas Copco has recently extended its GHS VSD+ range of variable speed driven oil-sealed rotary screw pumps with the addition of three new models offering flow rates up to 5004 m3/h. The new GHS 3800-5400 VSD+ rotary screw pumps are designed for large industrial vacuum users in the UK’s glass, plastics, canning and food packaging industries. According to Atlas Copco, companies in these sectors stand to reduce their energy consumption by up to 50% if they upgrade their existing centralised vacuum systems or switch from using multiple, decentralised point-of-use pumps to a central vacuum system based on one or two GHS VSD+ machines. The new pumps complement the existing GHS VSD+ range, launched in 2015, which enables users to precisely adapt their vacuum generation requirements to match the demands of their process. With an innovative motor design and inlet control valve, the range has been engineered to deliver improvements in terms of energy efficiency, noise levels and oil-retention. Typical applications include lifting and handling, forming and shaping, vacuum packing, preservation, freeze drying, pick and place and pneumatic conveying. The recently launched DZM multiple vacuum pump system combines between two and four single-stage oil-free DZS claw vacuum pumps in a single compact housing, offering a high degree of performance and reliability. It is suitable for a wide variety of dry pumping applications – from packaging lines, pneumatic conveyors and clamping systems for CNC machines, to moulding machines and drying processes. The GA VSD+ oil-injected compressor range is designed to help industrial air users reduce their energy consumption. GA VSD+ compressors are suited for a range of processing applications in the packaging sector, ranging from operating diaphragm pumps for moving liquids to forming bottles and filling packaging. Compressor distributor Air Kraft helps companies achieve annual reductions in compressed air power consumption of as much as £60,000. Energy savings of up to 50% in glass production.